Double Cleaning ist etwas, dass zu meiner täglichen Abschminkroutine gehört – erst mit Öl Cleanser, dann mit einem Foam Cleanser. 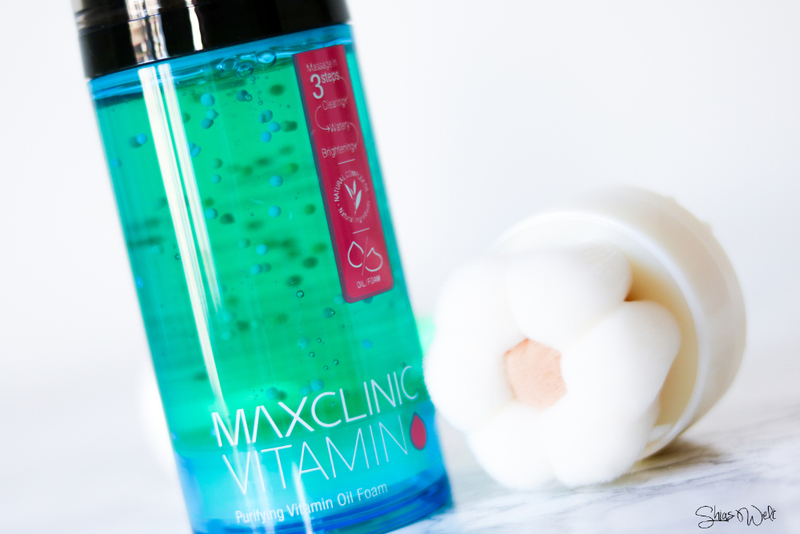 Dank dem MAXCLINIC Purifying Vitamin Oil Foam kann ich dies nun in einem Schritt machen und sparen mir so Zeit bei meiner 10 Step- Korean-Skin-Care Routine. Double cleansing is great but it takes much more time than cleansing with just one product. First i use an oil to remove my make up and afterwards, to feel more clean i use a foam cleanser. I know, many of you guys may think this is too much but actually it helped my skin a lot! You really should try it! But sometimes i am too lazy to do these steps and so i was happy that BNT NEWS sent me the interesting MAXCLINIC Purifying Vitamin Oil Foam. 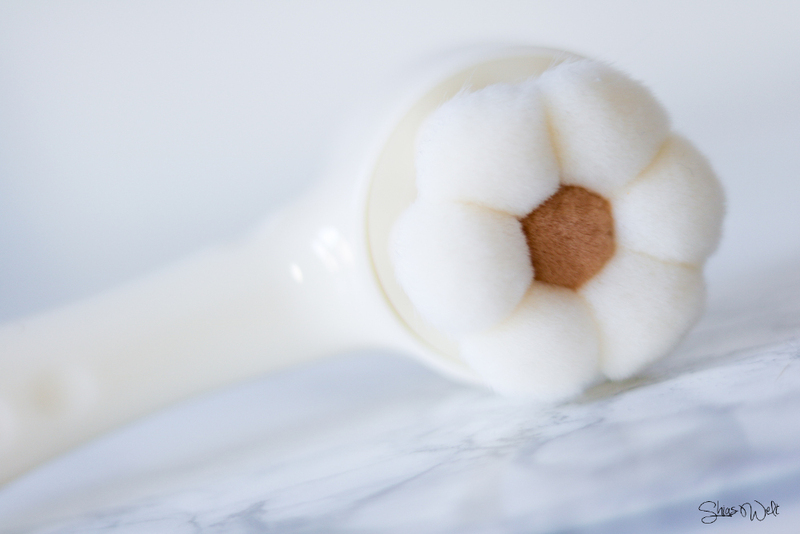 In combination with the Cloud Embo Massage Brush its a perfect 2 in 1 product – especially for lazy cleansing evenings. The MAXCLINIC Purifying Vitamin Oil Foam comes in a plastic container and you can get some of the product through the pump. Inside you can see little „Bubbles“ – i guess these are filled with the vitamins. The texture is quiet thick kinda jelly like. I really like the look of the product especially the vibrant color. I need 1 to 2 pumps for my entire face. First you massage it onto your dry skin – it’s a bit difficult because the texture is really thick. Afterwards you wet your hands and start massaging your face. The oily texture starts to get foamy which i really like. The scent reminds me of fresh Lemons. Actually i don’t like this kind of smell because it reminds me of cleaning agents for the bathroom. My skin doesn’t feel dry while using it – i hate nothing more than this squeaky clean feeling after cleansing. It removes my make up quiet well except my eye make up – here i have to use another cleanser to get rid of my mascara. It’s a bit disappointing because it’s a 2-in-1 product and it can’t get rid of my mascara. 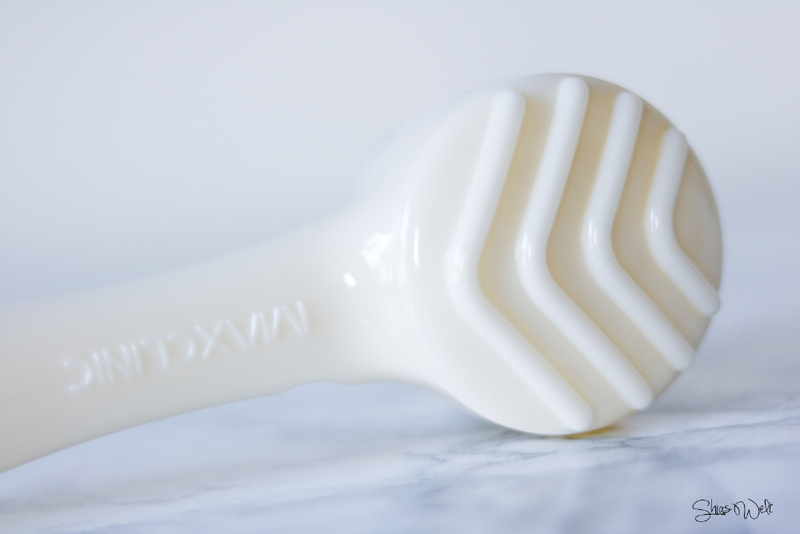 Best way to use the MAXCLINIC Purifying Vitamin Oil Foam with the Cloud Embo Massage Brush. The brush is so unbelievable soft – i love to touch the soft brush – „it’s so fluffy i wanna die!“. When you turn the brush around you see the V-shaped padding massage side. I really like to remove my make up with brushes like these – normally i use my Clarisonic Aria but this one is so much smoother and perfect for traveling. First you put the MAXCLINIC Purifying Vitamin Oil Foam on your dry face, then you use the V-shaped side to massage it into your skin. Afterwards you wet the brush and start to clean your face in circles. The foam is much nicer with the Cloud Embo Massage Brush. The brush is so soft so that i think its perfect for people with very sensitiv skin. And don’t worry, the brush doesn’t lose its softness after using it several times. After drying it’s super fluffy again! All in all i like the MAXCLINIC Purifying Vitamin Oil Foam and the Cloud Embo Massage Brush but its still disappointing that it couldn’t get rid of my mascara even though its not waterproof. I’m using this product when i am too lazy to do the double cleansing. 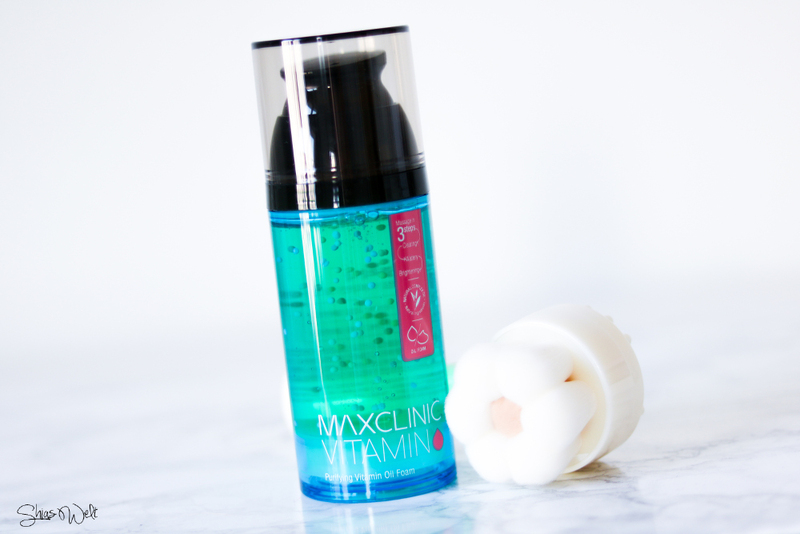 You can find the brush on eBay but i couldn’t find a retailer for the MAXCLINIC Purifying Vitamin Oil Foam.YOu can find a video about how to use the MAXCLINIC Purifying Vitamin Oil Foam here. MAC Extra Dimension Skinfinish Soft Frost – Der perfekte Highlighter?